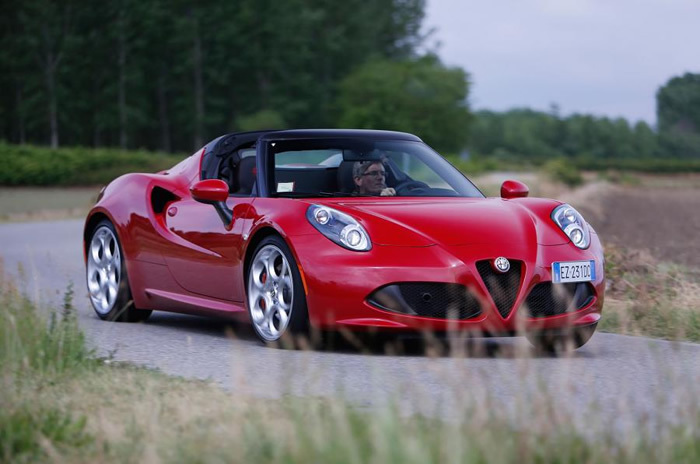 The Alfa Romeo 4C Spider. A quite gorgeous, 237bhp opportunity on wheels. For the 4C to redeem itself. We love the little Alfa’s looks, and the back-to-basics thinking that brought us a £45,000 creation featuring a carbon monocoque and unassisted steering. But the result has, so far, been a wayward and polarizing disappointment. 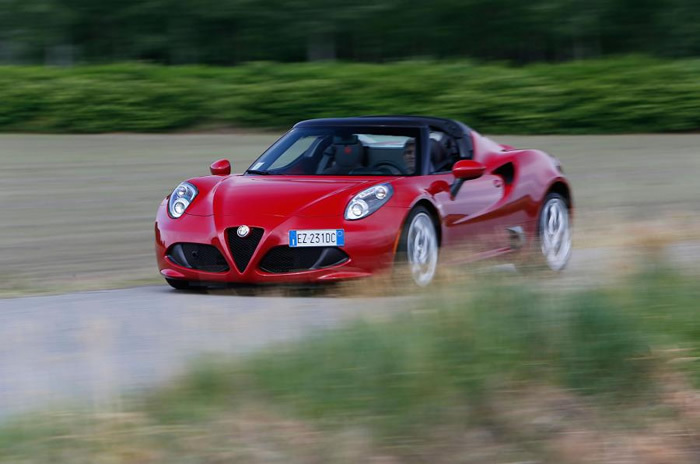 You’d imagine Alfa would’ve been strung by criticism of the 4C coupe’s stiff ride, droning exhaust, fiendish turbo lag, penchant for tramlining and bizarrely inconsistent steering weight. And the god-awful steering wheel itself, come to mention it. It’s been 18 months since the Alfa 4C exploded onto the scene and, to our dismay, got nowhere near a Lotus or Porsche dynamically. Plenty of time for a chassis rethink. 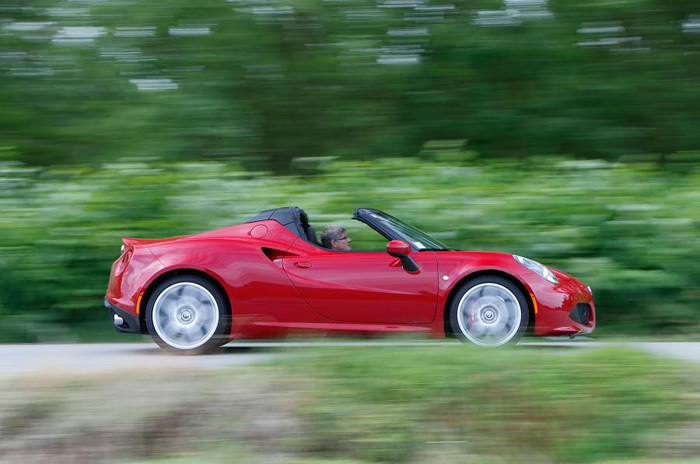 There’s more to the 4C Spider than an unhappy meeting between a 4C coupe and a hacksaw. Note the all-new, Ferrari-esque rear deck, featuring buxom buttresses and a curvaceous vent slicing into the engine cover. Rear visibility nukes the claustrophobic hard-top’s, and the even more dramatic (if slightly less elegant) side profile sprouts carbonfibre transmission-cooling intake. Best of all, the windscreen pillars and header rail are now fashioned in exquisitely finished carbon. Apparently, when the Spider was unveiled in Detroit, Italian carbon fetishist and part-time hypercar-maker Horacio Pagani strode onto the Alfa stand and congratulated his compatriots on the 4C’s weave. That’s high praise. Besides new alloys and a slightly less idiosyncratic radio, the only other tweak is new headlights. 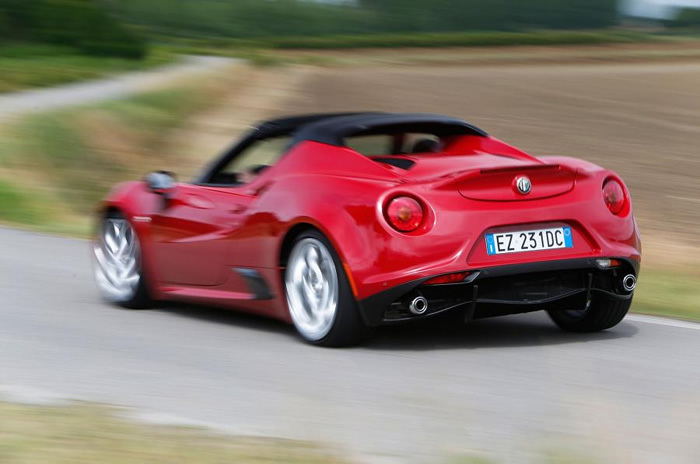 One-piece clusters are fitted to all 4C Spiders, finally ridding the 4C of its most controversial aesthetic feature – the fussy, cheap-looking bug-eye lights. Standard air-con, a sliding passenger seat and even the natty new headlights add kilos, so the Spider’s kerbweight rises from 895kg to 930kg. That’s about what a supercharged Lotus Elise weighs – but over 130kg less than a Lotus Exige Roadster and the same amount again less than any Porsche. The 4.5sec 0-62mph claim and 160mph v-max survive undented. Game on. Well, it’s not a push-button Audi TT-style job, and neither should it be. That’d be completely at odds with the 4C’s lightweight ethos, so instead you get a DIY fabric tent that fits in the engine-aft boot, or the option of Aventador-style carbon targa panels. The 7kg roof clips in with a fumble but feels securely tied down once you’ve busted your fingernails. Roof stowed, we were blown away by the refinement. Some wind-tunnel noise has led Alfa to create a spoiler lip across the rood header rail, deflecting the hurricane above over the top of the cabin, leaving the occupants cocooned. And not tone deaf. Well, the steering is better. Obviously we need to drive it in the UK to be sure, but we found some substitute shoddy Italian roads on this first impression. The Spider didn’t forget where it was being steered or charge off down the road following camber. The rest is largely as you were. Inconsistent steering weighting, a general lack of feel through the elephantine steering wheel, rubbish flat seats, and a bizarre combination of lazy, laggy throttle response and a twin-clutch gearbox that likes to be at ten-tenths to behave. The 4C is frenetic where a Boxster flows, but Alfa insists the car is ‘finished’ and this is how it intended – and how the owners it surveyed prefer the car. That’s the 4C Spiders on big wheels and ‘race pack’ suspension, anyway. The 4C is more spec-sensitive than a Nando’s menu. Alfa also brought along a basic car, wearing tiny 17/18-inch wheels, comfort-spec suspension, and fitted with the much-more mature standard exhaust. It was even right-hand drive, and it’s easily the sweetest 4C I’ve driven. The steering effort was far more predictable and manageable, and the car was barely deflected or camber-led. At last, it’s a 4C you can enjoy driving, rather than constantly managing its flaws in an effort to steer clear of your neighbour’s front garden.